Gail Williams is admired for her tenure at the Chicago Symphony Orchestra, her teaching at Northwestern University and at many clinics and workshops around the world, her solo and ensemble playing, and her support of new music. Gail grew up on a farm in a musical family. Her mother studied percussion and viola; her brother, clarinet. Gail studied with Jack Covert at Ithaca College, then earned a master's degree at Northwestern University and performed with Lyric Opera of Chicago for four years before winning the audition for the Chicago Symphony Orchestra in 1978. She was assistant principal until winning the position of associate principal in 1984, where she remained until retiring in 1998. Gail teaches at Northwestern University (since 1989), gives master classes at innumerable conservatories and workshops, is horn soloist with major orchestras, and is dedicated to performing chamber music. In 2001, 2005, and 2009, she has served as a judge for the Horn Solo Competition in Porcia, Italy and has coached young brass musicians with Summit Brass since 1986. She has been on the faculty of the Swiss Brass Week in Leukerbad, Switzerland for several years. Her music education degree and playing experience come together in her current teaching. 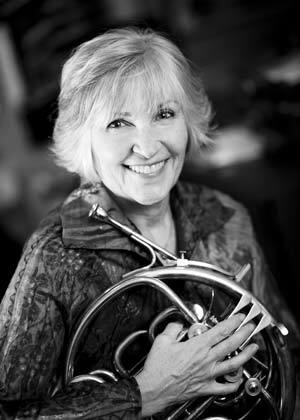 Gail is principal horn with the Grand Teton Music Festival Orchestra and was principal horn with the Saito Kenin Orchestra in Japan in 2004 and the World Orchestra for Peace in 2005, 2006, 2007, and 2009. Gail has performed as soloist with the Chicago Symphony, San Antonio Symphony, Sinfonia da Camera, New World Symphony, the Grand Teton Music Festival Orchestra, Syracuse Symphony, Fairbanks Symphony, Green Bay Symphony, and a number of regional orchestras. Gail is a founding member of the Chicago Chamber Musicians and Summit Brass. She has performed with the Vermeer Quartet, the Chamber Music Society of Lincoln Center in New York City, the Philadelphia Chamber Music Society, the Skaneateles Music Festival, Santa Fe Chamber Music Festival, and the Olympic Peninsula Chamber Festival, and she was the featured artist on a chamber music series in Ottawa, Canada with the National Arts Orchestra of Canada. Gail is active in commissioning projects and has premiered new works by Dana Wilson, Anthony Plog, Oliver Knussen, Yehudi Wyner, Collins Matthews, and others. In 1995, she premiered Deep Remembering by Dana Wilson and Anthony Plog’s Postcards at the International Horn Society Workshop in Yamagata, Japan. In 1997, she premiered Dana Wilson’s Horn Concerto with the Syracuse Symphony. A year later, she performed the Knussen Horn Concerto with the Chicago Symphony Orchestra, under the direction of Maestro Knussen. She helped commission Yehudi Wyner’s Horntrio, and was involved in the orchestration of Dragons in the Sky by Mark Schultz. She premiered another horn and piano work by Dana Wilson, Musings, in 2003 and performed the US premiere of a concerto for Horn and Orchestra by Collins Matthews at Northwestern University in June of 2005. Gail can be heard on recordings from Summit Brass, including solo recordings 20th Century Settings and Deep Remembering, and Northwestern University’s Goddess Triology, featuring compositions by John McCabe and works for horn and percussion by Charles Taylor and Alec Wilder. A CD with the Chicago Chamber Musicians was nominated for a Grammy award. Gail has been honored by Ithaca College with a Distinguished Alumni Award and an honorary doctorate. She received the Charles Deering McCormick Teaching Professorship at Northwestern University in 2005, which allowed her to commission and performed new chamber works by Douglas Hill, Dana Wilson, and Augusta Reed Thomas. She was a member of the IHS Advisory Council (1997-2000), received the Punto award in 2008, and was elected an Honorary Member is 2012.